Golden Road Pineapple Cart is the third in this series highlighting the famous LA fruit carts. Though this one bears the pineapple name, it's also brewed with blood oranges and strawberries. Can art is fun. 4.0% alcohol. Pineapple is clear in the aroma. 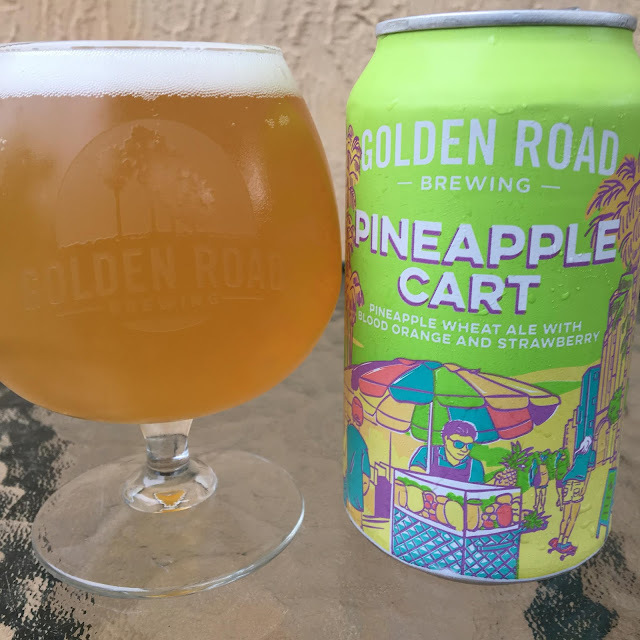 And the pineapple flavors are sweet and pleasant first sip, really playing nicely with a super light tartness underneath. The wife told me this isn't really tart, basically dismissing any claim this beer has to tartness since she hates that type of beer. Anyway, tangy wheat, light tartness and subtle hints of strawberry round things out. I liked it! Very refreshing.